This article is dedicated to my friends who were taught by the WMSCOG that Ahn Sahng-Hong did not have any children… only to find out later that he did. I have friends who were in the World Mission Society Church Of God for a long time. Many were told that the supposed founder Ahn Sahng-Hong had no family. As it turns out, he did. 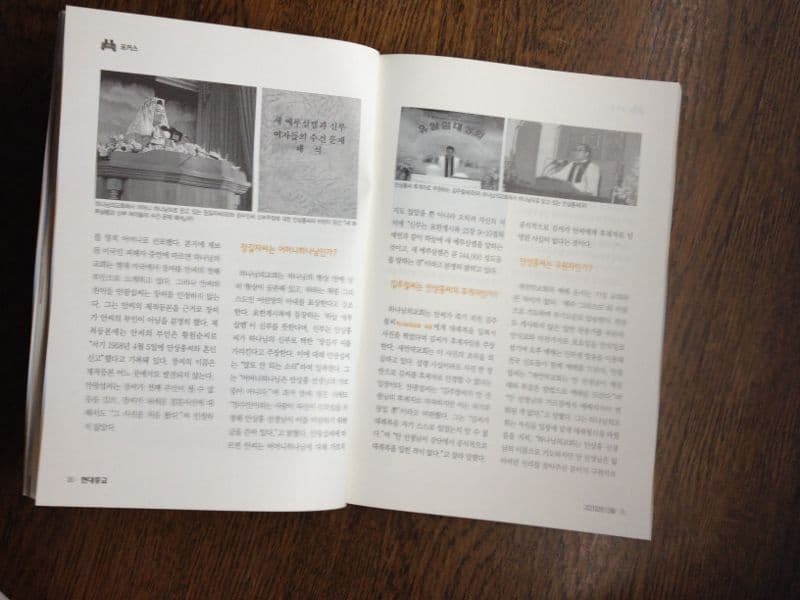 Not only are Ahn’s childrens names purportedly written on his tombstone, but the February 2012 issue of Modern Religion Monthly magazine in South Korea contains an interview with Ahn Sahng-Hong’s eldest son Ahn Kwang-Sup. (He uses a nick-name as his first name). If you would like to get in touch with Ahn Kwang-Sup, he is still a member of the New Covenant Passover Church of God (NCPCOG) today, the church that Ahn Sahng-Hong founded. (Click here to see a picture of Ahnsahnghong with his son on right, or here for more pics). Ahn Sahng-Hong did not believe in a mother god. Neither does the NCPCOG. 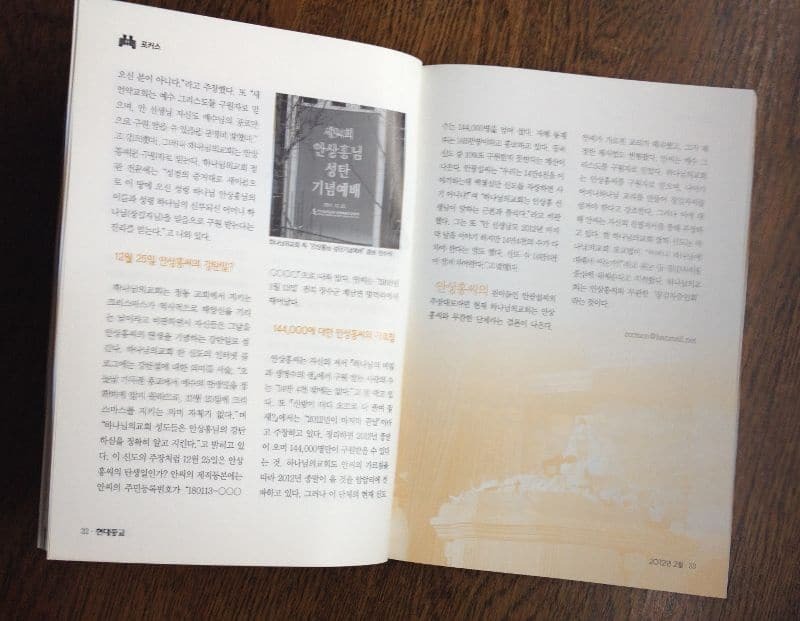 Ahn Sahng-Hong wrote against the idea of there being any mother god in his book. Ahn Sahng-Hong was married to Hwang Won-Soon (click here and here to see pictures of Ahn Sahng-Hong with his wife Hwang Won Soon and their daughter). Ahn Sahng-Hong only prayed in the name of Jesus Christ. The NCPCOG only prays in the name of Jesus Christ. 2012 is the end of the world according to both the NCPCOG and the WMSCOG (see further supporting evidence for this here). 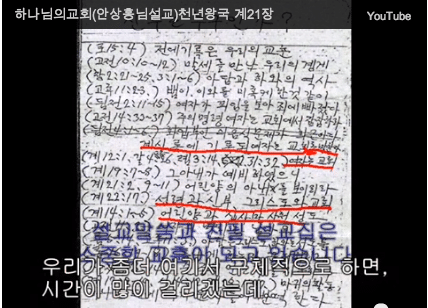 The Ahn official family register was provided by Ahn Kwang-Sup to the magazine as evidence that Zhang Gil Jah was never Ahnsahnghong’s wife (pictures in the article). The interview has been re-published below by permission from Modern Religion Monthly magazine in both PDF and Text format for your reading enjoyment. The language and opinions adopted in the article do not necessarily represent the opinions or views of this site or its ownership. 28_ The Church of God is Zhang Gil-Jah’s Congregation! 34_ Shock! Obscene JMS syndicate revealed! The Church of God is Zhang Gil-Ja’s Congregation! 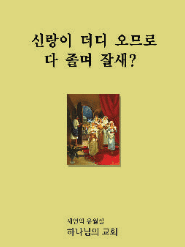 The Church of God – Zhang GIl-Ja, Kim Joo-Cheol believes that Ahn Sahng-Hong is God the Father. 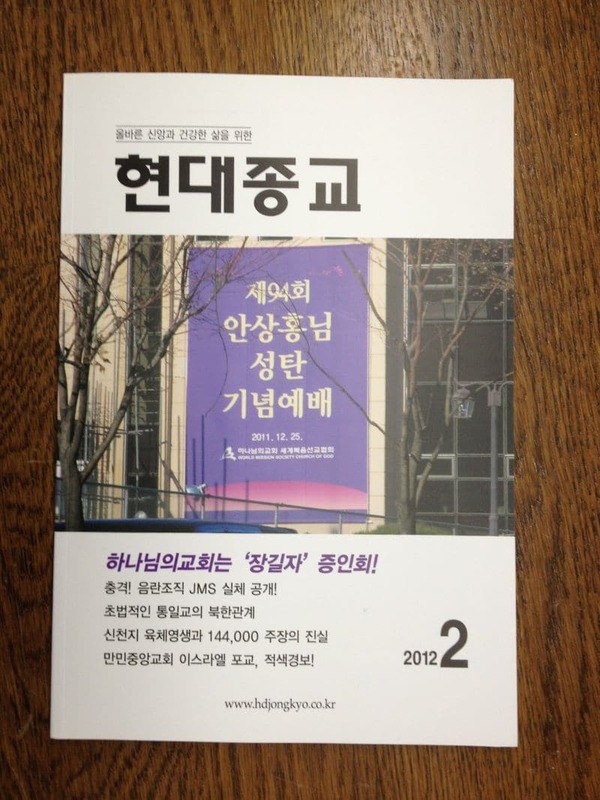 However, according to Ahn’s son Ahn Kwang-Sup, the organization has nothing to do with Pastor Ahn. Ahn Kwang-Sup talks about the Church of God as he sees it. The Church of God, which believes that Ahn Sahng-Hong is God the Father, appeared on the scene after Ahn’s death. It also deifies Ahn’s wife, Zhang Gil-Ja, as “the Heavenly Mother”. The Church of God is expanding its influence by upholding its public image as an active participant in community volunteer services. However, the Church is being criticized by the New Covenant Passover Church of God (New Covenant Church) which reportedly follows the teachings of pastor Ahn and the traditions of the organization. Each congregation claims that it is based on the authentic teachings of Ahn Sahng-Hong. Ahn Kwang-Sup, a son of Ahn Sahng-Hong as well as an elder of the New Covenant Church, spoke to us about The Church of God. Is Zhang Gil-Ja the wife of Ahn Sahng-Hong? After Ahn’s death, the congregation went two separate ways: the God of Church that believes in Zhang Gil-Ja as the Heavenly Mother and the New Covenant Church that adheres to the traditional doctrine of Ahn. The Church of God proclaimed that Zhang was the Spiritual Mother, on the grounds of a wedding photo of Ahn and Zhang. According to the testimony we received from a victim based in America, the Church of God in the U.S. currently presents Zhang as the first wife of Ahn; a claim that Ahn’s own son, Ahn Kwang-Sup, does not accept. Ahn made it clear that Zhang was not his father’s wife, citing Ahn’s Detailed Family Census Register as evidence. On the Register, Hwang Won-Soon is recorded as Ahn’s wife and it says that she “reported the marriage with Ahn Sahng-Hong on the 5th of April 1958”. The name Zhang Gil-Ja is not found anywhere in the register. Ahn Kwang-Sup stressed that Zhang could not have been the first wife and he did not verify Zhang’s wedding photo, saying that he had never seen it before. Is Zhang Gil-Ja the Heavenly Mother? The Church of God emphasizes that the images of man and woman are contained within the image of God and that Eve symbolizes the bride of the Second Coming of the Christ. It claims that the ‘Heavenly Jerusalem’ mentioned in the Revelation of John implies the bride and thus points to Zhang Gil-Ja, since she is the Heavenly bride chosen by Ahn Sahng-Hong. The claim is dismissed by Ahn Kwang-Sup as “a load of nonsense”. “The Heavenly Mother is not part of Ahn Sahng-Hong’s teachings”, he said. When Ahn was alive, “a person called Um Soo-In once claimed that she was the bride and Ahn Sahng-Hong rebuked the claim in writing”, he added. According to Ahn Kwang-Sup, pastor Ahn had never taught about the Heavenly Mother and had clearly written that “the bride means the New Heavenly Jerusalem as recorded in the Revelation of John 21:9-10 and the new Jerusalem translates into 144,000 members of the congregation”. Is Kim Joo-Cheol the successor of Ahn Sahng-Hong? 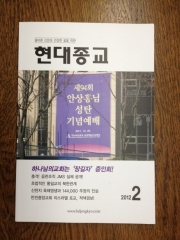 The Church of God claims that Kim Joo-Cheol – the leader of the Church of God – is the successor of Ahn, because Ahn dressed Kim in full ceremonial uniform and took a photo of Kim. The New Covenant Church suspects that the photo may have been forged. Even if the photo was genuine, the Church maintains that Kim cannot be accepted as the successor on the basis of a single photo. Ahn Kwang-Sup criticized Kim’s claim, saying that “Kim proclaims to be Ahn’s successor but that is just his opinion”. “It is not known whether Kim put on the uniform himself at the time. Pastor Ahn had never publically dressed Kim in a formal ceremony”, he said curtly. As far as he is concerned, Kim has never been formally appointed as the successor by Ahn. Is Ahn Sahng-Hong the Saviour? The service performed at the New Covenant Church is not much different from that of the mainstream churches. The parishioners pray in the name of ‘Jesus Christ’ and recite the Lord’s Prayer. They sing unmodified mainstream hymns. Like the Seventh-day Adventists, they observe Saturday as the Sabbath day. “The New Covenant Church worships God in the same way we did when pastor Ahn was alive’, Ahn Kwang-Sup said. He pointed out that the Church of God changed the service format to suit its own views. “Although the Church of God prays in the name of pastor Ahn Sahng-Hong, Ahn was not the saviour of people, he was just someone who found the truth people had lost”, he stated. “The New Covenant Church believes in Jesus Christ as the Saviour and pastor Ahn himself made it clear that only the work of Jesus could save us”. The Church of God, however, believes in Ahn Sahng-Hong as the Saviour. In its full articles of incorporation, the Church states that “we believe in the truth that we will be saved by the Heavenly Spiritual Father Ahn Sahng-Hong who came to the world, as written in the Bible, and by believing in the Bride of the Heavenly Father, Zhang Gil-Ja”. 25th of December marks the Nativity of Ahn Sahng-Hong? Church of God criticizes the Christmas day celebrations held by the traditional churches as worshiping the historic Sun God and it celebrates the day to commemorate the nativity of Ahn Sahng-Hong. One member of the Church describes the meaning of the nativity day in his internet blog as follows; ‘since the mainstream churches do not know the exact birth date of Jesus, celebrating Christmas on the 25th of December has no meaning whatsoever. The members of the Church of God know the exact birth date of Ahn Sahng-Hong and celebrate the day accordingly”. Is Ahn Sahng-Hong’s birthday the 25th of December, as this believer claims? In the Detailed Family Census Register, Ahn’s citizen ID is recorded as “180113-OOOOOOO’. He was born on the ’13th of Jan 1918′ in Myungduk-ri Gyenam myun, Jangsoo-gun, Jullabukdo. In his book called [The Mystery of God and the Spring of the Water of Life], pastor Ahn concludes that the number of people saved will be no more than 144,000. He also claims that “2012 will be the end of the world” in [While the Bridegroom Tarries, All the People Fall Asleep?]. In a nutshell, the world will end in 2012 and only 144,000 people will be saved. The Church of God supports this prediction and is secretly spreading the message. The number of believers in the Church, however, is currently over 144,000. The Church claims that the number reached 1.45 million according to its own survey, which would mean that less than 10% of the congregation will be saved. Criticizing such a claim, Ahn Kwang-Sup said, “When we are talking of the number 144,000, it is fraudulent to boast the figure that goes beyond a million. The Church of God essentially deviates from the foundation laid by pastor Ahn”. “Pastor Ahn talks about the last day of the world in 2012 but he also said that we need to fill the number 144,000. So we need to fulfil this number first”, he added. 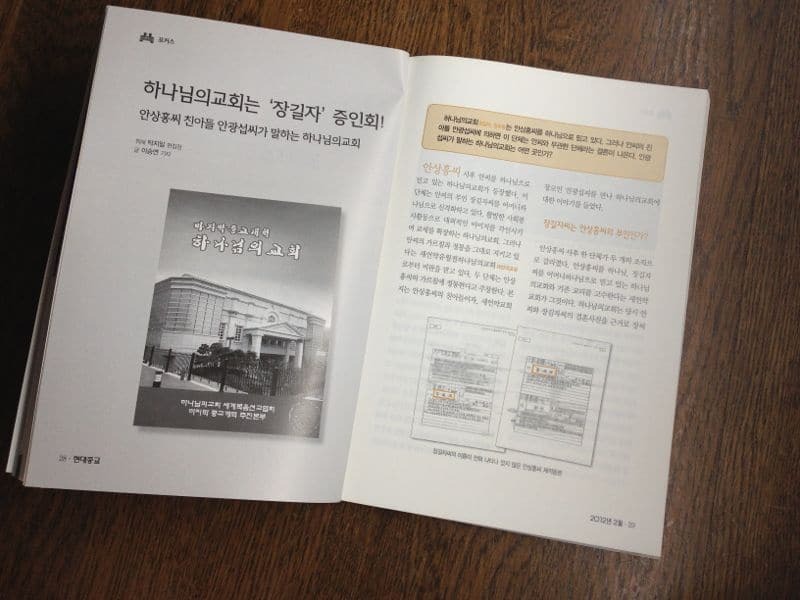 The claims made by Ahn Kwang-Sup, the son of pastor Ahn Sahng-Hong, indicates that the Church of God has little to do with Ahn Sahng-Hong at present. Ahn’s teachings have been twisted and the worship ceremony established by him has lost its original form. While worshipping Ahn Sahng-Hong as the Saviour, the Church further created the Heavenly Mother doctrine and encourages the members to worship Zhang Gil-Ja. This was, however, denied by Ahn in the book written by himself. One ex-member of the Church of God reported that the Church presented Zhang Gil-Ja as the central figure, asking would-be believers whether they “knew about the Heavenly Mother”. In other words, the Church of God has nothing to do with Ahn Sahng-Hong and has everything to do with Zhang Gil-Ja. The World Mission Society Church of God is… [moved by admin to forum here]. The problem is WMSCOG has members not trusting this site, hence the lawsuits filed by WMSCOG to shut this site down. WMSCOG members will not even consider the evidence put out by this site. Dear No Name. No one can prove AhnSahngHong isn’t God. Not even his child. Why? AhnSahngHong didn’t commit adultry. He didn’t physically marry Heavenly Mother nor have intimate relations with her. This is why this entire website is a lie. Please come to WMSCOG, let’s be the elect children of Promise like Isaac!! How was Isaac chosen? Because sacrifice was handed down to him as with all the forefathers of faith. God bless you. But, there are so many proofs of his lies. Please leave while you can, as I recently did. If you weren’t questioning you wouldnt be here. I was in your shoes only a month or two ago. I have ordered court proceedings, and spoken with former members (not just relying on one site). The lies pile up pretty high. And in my former Zion, there were a few older members whom DID confirm that 2012 was thr predicted, end….and we see that didnt happen. Well I was informed that WMS has very deep pockets, and has already sued NCPCOG. They sue for slander at every turn. If your a WMS member who wandered here answer this question, “Do you remember signing a confidentiality agreement?” The zion I was in, had our members sign one. It was coded, since I have a small legal background I caught it. I spoke to a former member who questioned some practices in his old zion, and was asked to sign one to keep his mouth shut. Never signed it, but they are slick. In my experience I have heard from members and ex members that when you sign up for their official webpage/phone app, your agreement to the terms and conditions is the confidentiality agreement. Is there any prophecies in the Bible that indicates that we can know if Second Coming Jesus’s son can testify whether He is Second Coming Jesus or not? I only know for sure that only the Scriptures testify about Him. Then why is there a need to hear the testimonies of His son? Would Ahn kwang sup’s testimony teach us biblical prophecies about what 2nd coming Jesus must fulfill? All prophecies about 2nd Coming Jesus were fulfilled by Father Ahnsahnghong. If you dont believe the prophecies or dont even know what prophecies He must fulfill at the second time, how can you judge that Father Ahnsahnghong is not the 2nd coming Jesus? You Pharisees of this age! How will you escape the punishment for all your evil deeds! I suppose that the trumpet blast, every eye will behold Him, and every tongue will confess He is Lord all mean nothing this time around? I know, WW1 is supposed to be the trumpet blast. Let’s assume that could possibly be right. What about the rest? I guarantee that every eye did not behold Ahn and every tongue will NOT confess that Ahn was Lord. If it’s not the truth you must throw it out. Sorry, but Ahn is NOT God. It’s very easy to see if you seek the truth. By myself I have sworn, my mouth has uttered in all integrity a word that will not be revoked: Before me every knee will bow; by me every tongue will swear. Christ Ahnsahnghong has been seen by the whole world! Many people from all nations are flooding to the Church of God, which we call Zion (Micah 4:1-2, Psalms 102:16-22) which God Himself has built. Simply put, every eye did not physically behold and confess that Jesus was Lord 2000 years ago, as Isaiah prophesied. However, everyone knows that Jesus is the God of Christianity today, even if they don’t believe it to be true! In the same way, the entire world will know that Ahnsahnghong is God, the Holy Spirit & New Jerusalem is Heavenly Mother of the World Mission Society Church of God even if they do not believe. This will be the fulfillment of the prophecy of Second Coming Christ in Revelation, just as the prophecies in Isaiah and Philippians have come to pass. I hope this clears things up for you a bit more! Please visit your local Church of God and explore more about the church to truly know what’s going on! God bless you! Btw, I do apologize for the # miscalculation in reference to the # of people that aren’t Christian. I mistakenly put how many people are living on the planet (which is 7 Billion)! I meant to put that as a reference to subtract from, with the more accurate # of non-Christians being roughly 5 Billion! Thank you and God bless you! Well, I see the OBVIOUS flaws in your thought processes here. I am impressed that you knew where to go in the Bible to find these verses. What you NEED to do next is study the context and realize the timeframes which is spoken of. There are way too many things wrong with the interpretation of Gods Word by the WMSCOG. This is the purpose of this website. In a way the WMS created this so be careful how you judge us. BTW, I have tried to visit your group in several cities and I have also had conversations with several so called missionaries, deacons, and pastors. None of them had any satisfactory answers. Oh there was a ton of scripture twisting and taking things out of context but NO REAL ANSWERS. By researching outside of the confines of the WMSCOG you will find that what I’m saying is true. Obviously you have taken time to learn how to think about the scriptures as well as historical events as the WMSCOG wishes you to think about them. It’s your turn to discover if what you’ve been taught is the truth. You’re going to find that you’ve been lied to by the very group that has told you that everyone else has lied to you. This is a very cult like thing to do. Remove you from outside information. You’ve gotta do research outside of the WMSCOG if you’re going to find the TRUTH! How can you say the whole world has seen Ahn? A lot of people have never even heard of this cult. If a person was stuck on an island with just a Bible they wouldnt be saved bc this added information is not in the Bible. No one has even heard of that award you received. Doing volunteer work doesnt get you to Heaven. Not to mention you are supposed to be humble. You apply for this award and Barack Obama has no idea who you guys are either. Please preach uour blasphemy somewhere else you guys have already been exposed on this site. I would like to personally invite Ahn Kwang-Sup to the United States!!! I have a spare room at my house. I would love for him to speak to my daughter who is brainwashed by WMSCOG. My 1yr old and 4yr old grand daughters are the TRUE VICTIMS. They are the ones who are reaping severe unhealthy consequences from WMSCOG. If Ahn has any compassion for others he would consider this invitation!!! I would like to invite him here but the link to get in touch with him is in Korean!! This site doesn’t have the truth!! It’s wrong!! G, can you be a little more specific? What content on the site do you believe is “wrong”? Please post in the forum. Thanks. prove it, or YOU’RE wrong. That is all. Proofs already presented,what’s more proof you need. You’re brain isn’t working. Probably already tortured by love bombing which is a tool of WMSCOG to control everything in you and by that you’re intelligence become dumbness of thinking. Well state your facts, just don’t say something is wrong and not do your own research to disprove it. It is ok to admit that you have been believing a false gospel 1John 1:9 says that if you confess your sins he is faithful and just ad will forgive us our sins and cleanse us from all unrighteousness.” Come to Christ my friend! What more proof you need for you to believe. There’s already in this site the translation of the interview including that of the names of the family of ahnsahnghong marked in his tomb and still you don’t believe. Show then to us any marriage contract of ahnsahnghong and your mother god zahng gil ja if they were really married as per your WMSCOG records. All of you members of WMSCOG are lied to and deceived by love bombing of your deacons and pastors. Aren’t you all not ashamed in worshiping false gods which makes you pagans? All proofs are here already and one more thing WMSCOG was branded as a cult by the South Korean government and this thing also you don’t beleive? WMSCOG makes you dumb and foolish. Don’t you feel it? Christ AhnSahngHong didn’t physically marry Heavenly Mother. Show proof we ever said that remco. If you can’t you belong to the father of lies. I now prove that there will people that will deny GOD because they were used by satan. Mike, what “proof” are you talking about? The Bible tells us that Satan will do these things but I hope you are not using those scriptures as your “proof”. We have spent years now testing the doctrine and studies of the WMSCOG and the proof of much of this effort is in this website. We completely deny that Ahn and/or Zahng/Chang/Chung, or whatever other alias she has gone by, are God. Please be much more open and obvious with any “proof” that you think you are bringing here. Thank you. The atheists deny the existence of GOD. WMSCOG deny the true GOD but they have their false gods. WSMSCOG is just one instrument of SATAN to carry on his lies and deceptions. Worshiping a dead and even a living person is evil in the sight of GOD – I mean the true GOD, the Creator of everything. Who then is being used by Satan? The Atheists just don’t believe in GOD, while WMSCOG have even more worst crime for ejecting GOD from His Throne and replaced Him with their invention. Are you not the one who was been a instrument by satan? Don’t do this kind of comments for you and all of the people using this site that saying World Mission Society Church Of GOD is a cult and a merely instrument by satan. I already seen the truth, my eyes had been deeply opened about the truth there will be no need of proofs if you do believe and think beyond your physical life. If the World Mission Society Church Of GOD is a cult and an instrument by satan? How do possibly satan wants us to remember again the things he destroyed thousands of years ago for us not to recognize GOD the Father and God the Mother and fall again to his deceptions. I hope you enter the World Mission Society Church Of GOD and study it by yourself and not by consulting this kind of website and believe those people saying about this religion and I’m sure that you will know the truth. May heavenly Father and Heavenly Mother guides you to the true way. I know what will you reply to my comment but I’m telling you for one last moment that I will not deceived by you nor Satan’s doings.. I don’t remember Jesus EVER teaching us about a god the mother. Please show me where to find these teachings. While you are at it show us your research that “proves” that Satan did away with god the mother so that we did not remember. Your eyes have been deeply opened (whatever that means) and thinking about God requires thinking outside of our physical life. If you imagine that you are so enlightened above us then I encourage you to please share out of your extensive knowledge. I prefer to follow the ONE TRUE GOD of the BIBLE. Boy I’m looking forward to your comment based on your statement…”I know what will you reply to my comment”. There is no need for me to show proofs, we always insist proofs for us to believe because we must seen it in our own physical eyes but like I said if you believe and think beyond your physical life there is no need for you to have proofs because you already seen it with your spiritual eye. Like I said you will not agree to my comment its not because you don’t believe it’s because you really don’t want to believe.There is no need for me to justify what I said its up to you. You don’t need any kind of proof to believe in something? What kind of misguided lie is this? I’ve seen animals being lead around by a ring in their nose that have deeper thought processes than this. You don’t need proof and I don’t have to provide any in order to get you to believe in something? Wake up Mike or you are going to waste your entire life being used by whoever comes up with the next creative story. On second thought, maybe you need to stay right where you’re at because if this is in fact your veiwpoint you will not be able to survive in the world that God created. Good luck but I hope you don’t really believe what you wrote above. I’ll keep asking for the proof and the truth that is always revealed both spiritually and physically. I think you’ve chosen a cowards approach to life. What you guys really mentioning here in this kind of site is not the things they thought us so meaning all the evidences presented here is not and will not always be true. Your just doing it for a reason and that reason is not good. Brother Mike was bombarded with lots of indoctrination and love bombing. My personal advise my dear friend, read the bible starting from the first page and sequencely up to the last page getting what is the theme behind each book you finished reading. Reading the Bible requires keen understanding and logic standing to reason. You’ll come to know creation, who’s behind creation, who is he and what he wants for his creation to follow to qualify for his plan – and what is that plan? PARADISE and HELL. All of us will experience death that we will be raised up again resurrected not reincarnated on the Day of Judgement. We are and will all go back to HIM to face judgement, we like it or not. In the second life, death will be no more, we all live but where we gon’na be depends entirely from our doings and have had undertaken here on earth while we are in our first life. By cherry picking the Bible, one will not be able to grasp the history of GOD and humankind. Make your choice brother, if your mind and heart finds WMSCOG is your final conviction as you believe them, nobody can pull you out from their hold if you yourself holds to them. Mike is probably Asian and foreign born. I can tell by his use of language. Mike, are you in the Philippines? That would be my guess, I would be interested in knowing if I am right. Anyhow, I know you are upset with people for posting freely in a place where your “church” cannot remove the comments. If WMSCOG could, they would have removed this site long ago. Any organization of that mentality can be counted on to be a tyranny if given too much power. Think about it… if they had power to punish in any way they pleased, then do you really think they would stop at lawsuits and comment removal? Think about it…. You should feel lucky that we are here defending freedom to post against this organization at a very minimum, even if you do not agree with us. If COG ran the world, there would be no freedom. Even publicly disagreeing would be forbidden. I am not worried about you. Once you get older and less important to these people, then you will be treated differently and you will see what I am talking about. Just as long as you “keep your head in all situations”, you will leave on your own. I am actually quite interested to learn about what Mr Ahn’s original teachings were. Just for the sake of learning history, you know? Yes Kai Ting I do know. my gf was more or less raised in this religion and her family asked me to learn about it so I did and I am appalled. I’ve done online research as well as sit don with church members to hear what they say and it makes sense when they speak but only because the build bridges with words that aren’t there. they are VERY slick with their speech and they are good at leading you somewhere without you knowing. when I asked a bunch of these questions two days ago, feelings elevated and they would barely let me speak. bottom line is: questions are welcome unless you know what you’re talking about.